Move 30 tons of pistachio oil via air freight from Sacramento to Stuttgart, Germany? No problem for Pilot Freight Services’ Sacramento team. The shipment, which totaled 23,770 kilos and encompassed 30 drums, was for a customer of Pilot’s German partner. The real challenge came when the TSA put a hold on a portion of the large load at the airport. 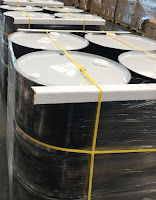 “We had to return one drum to the shipper, coordinate recovery of the 29 drums left and then tender them to a new airline,” explains Pilot Sacramento's district manager. She credits the joint effort among her fellow Pilot teammates, the supplier and Pilot’s German partner for bringing the project to a positive completion!